← Wanna Be A Movie Star? Peace Corps Documentary Calls For Support. The Returned Peace Corps Volunteers joined vendors from around the capital region to celebrate International Women’s Day at the Opalka Gallery at Sage College in Albany. The event was organized by the International Center of the Capital Region and took place from 2-5pm on Sunday, March 8th. 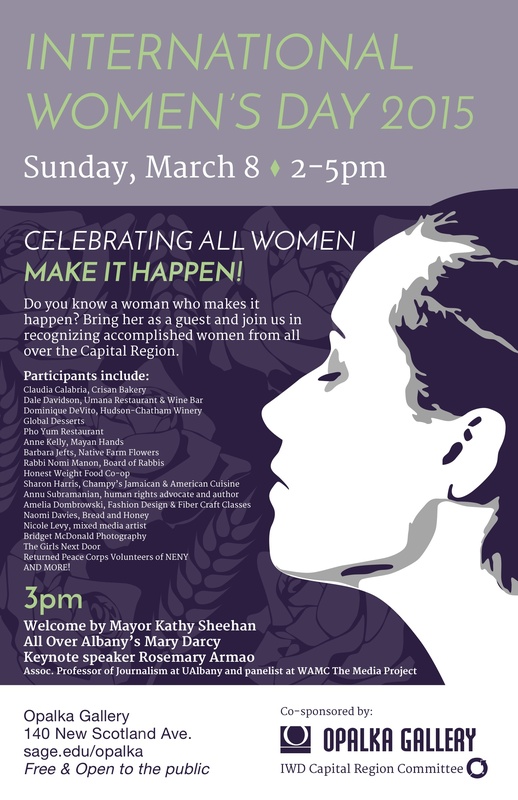 Over 100 people came out to celebrate and enjoy some good food and inspiring words from guest speakers Mayor Kathy Sheehan, All Over Albany’s Marcy Darcy, and UAlbany Professor Rosemary Armao. It was a fantastic event, and we were honored to participate. Jane Thapa and Kathy Sanderson holding down the fort while I get more Earl Grey cookies from Honest Weight Food Co-Op. A good sized group and a successful event.